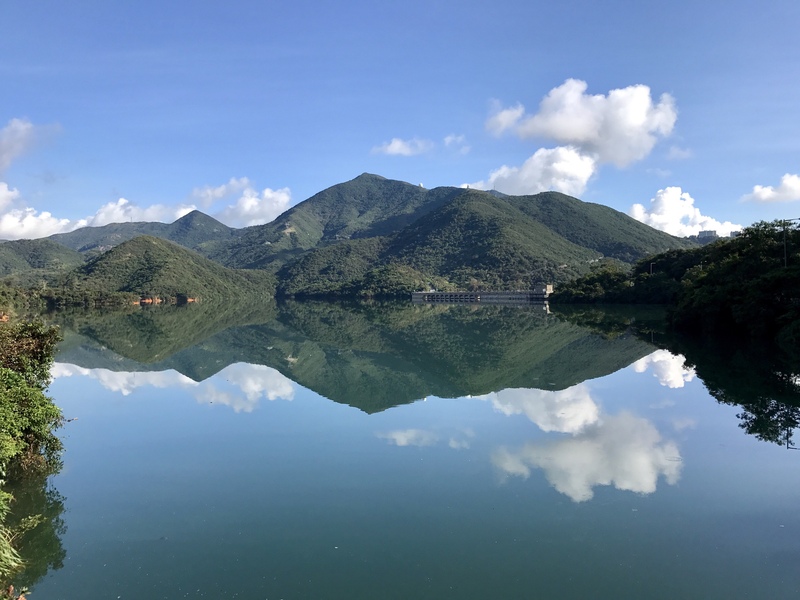 Nam Cheung Country Park is in the New Territories, Hong Kong near Fanling but it is a trail worth visiting. It is absolutely stunning with a lovely waterfall, bumbling brooks and a Deep pit pool. I hiked up this lovely trail on a cold 6 degrees Saturday morning with three friends and we came back rejuvenated and happy with our new discovery. How to get there: We took the MTR from Sai Wan Ho to Quarry Bay and interchanged to the Tsuen Kwan O line ( purple line) to take the train to Yau Tong , then from Yau Tong we interchanged to the Whampoa line ( green line ) and took the train to Kowloon Tong. From Kowloon Tong we interchanged to the East Rail line I.e Lo Wu/ Lok Ma Chau line and alighted at Fanling station. The total train journey was over an hour. From Fanling MTR we went to the mini bus terminus and took 56 K where the driver told us that Nam Cheung Country Park was just a 10 minute walk away. We saw Nam Cheung and walked down the road. We spotted a heron on the way and this lake. Some beautiful sights on the way . We spotted a sitting area and a public toilet too. Finally we came to the start of the trail. We came across lovely bamboo. Rocky terrain graced our path. Distance post 2501 passed still over 10 to go. Loads and loads of rocky steps on the way. We came to a lovely waterfall. This was just a part of it. We sat there and had steaming hot tea with cookies. We came to this sign board and walked toward Tan Chuk Hang. We kept walking and then saw the beginning of this wondrous waterfall. We had to climb down rocks and catch on to branches but it was worth it. It was awesome. This was the path we entered to go to that waterfall. We continued up the steps again. We came to a sign board and followed the path. We met a group of fellow hikers too who lived in the New Territories. We got lovely sights and sounds as we hiked up this trail. We were really high up. It felt like that. Thanks to distance posts we knew we were on the right track. We decided we didn’t want to climb another peak so we went straight and didn’t take the left towards another trail. We continued toward Tan Chuk Hang towards the village. We were amazed such beauty. So high up in the hills, breathing fresh air. We continued down the steps. Finally we reached the end. We followed the sign board stating Tan Chuk Hang. We came to this lovely village with lovely houses and loads of fruits, flowers and vegetables growing there. We continued walking through a tiny path to the Nini bus stop. Found a toilet too and loads of tiny fields filled with cabbage, lettuce, radishes and turnips. We got a cab ( else you can take 56B mini bus to Fanling MTR) and took it back to Fanling MTR ending with some hot tea and egg sandwiches. What a lovely start to the weekend. Enjoyed every bit amidst nature, babbling brooks and greenery everywhere. Do try this one. It is beautiful.